Dual axle allows for multiple seat-to-floor height positions. Adjustable height, flip-back, removable, padded arms. 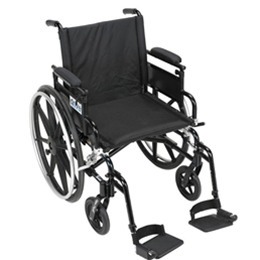 Over center cross brace eliminates seat guides, works with seating and positioning accessories. Adjustable angle back easily adjusts from 5 degrees - 20 degrees. Adjustable height back adjusts from 17" - 19" in 1" increments. Durable, heaby gauge flame retardant nylon upholstery with Velcro modesty flaps, resists mildew and bacteria. Quick release, 24" composite mag-style wheels are lightweight and maintenance free. Precision sealed wheel bearings in front and rear ensure long lasting performance and reliability. Adjustable angle caster forks have 3 height adjustments and angle adjustability. Tool-free adjustable swing-away footrests also feature easy to access release handles. Urethane rear tires and casters offer superior performance, smoother ride and are lightweight. Adjustable anti-tipper with flip-up wheels. Never needs to be removed. Comes with push-to-lock wheel locks.